Silicon Dioxide, Calcium Silicate, Stevia Extract, Natural & Artificial French Vanilla Bliss Flavor. As a dietary supplement similar to coffee creamer, Mix 1 scoop in coffee, tea, or beverage of your choice and stir thoroughly after mixing. If tolerated well, multiple servings can be had daily. Have you taken a look at those "coffee creamers" on the shelves at grocery stores the past couple of decades? There's not even any cream in them!! Corn syrup solids, sugar, low-fat milk, caramel… you name it. They've got everything but the cream! While they've been engineered in a lab to taste great, they are devastating to anyone who drinks them in the morning -- especially for keto dieters! Meanwhile, adding coconut oil, butter, or heavy cream either turns your coffee into a disgusting oily mess, or simply doesn't taste like you'd want it. Despite all of the coffees with fancy names and millions in "investment", the ketogenic community has a serious coffee problem. They are all weird, unpalatable, and quite frankly unacceptable solutions. That is, until Sparta Nutrition stepped into the ring. KETO COFFEE: THE ONLY WAY TO DRINK COFFEE IN KETO. 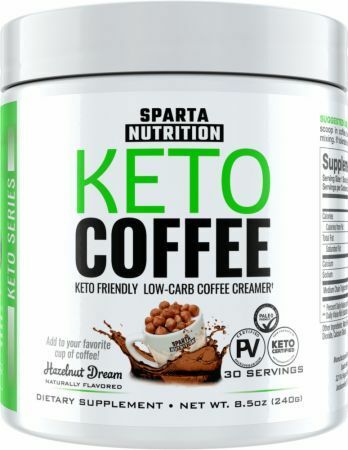 Keto Coffee is the ultimate powdered MCT oil based coffee creamer on the market. We designed it to solve all of the problems discussed above, in order to enhance a low-calorie, and no sugar added coffee creamer that enhances your morning -- and your state of ketosis -- while transforming your usual morning coffee into something truly delicious! No oily, buttery mess here. Just pure convenience and epic taste! Keto Coffee Creamer has no sugar added, GMO’s, or even low-grade palm oil. Just a high-quality blend of MCT oil powder with wonderful natural flavors and sweeteners to help support weight loss goals and offer numerous overall health benefits. MCT’s are an excellent addition to anyone's diet, but they're especially great for those living the low-carb, ketogenic lifestyle. Since they quickly convert to ketones (rather than blood glucose), they provide you with instant energy on top of that incredible caffeine that comes with the coffee. MCTs are a mainstay in the keto dieters journey into ketosis, and now you have one more way to take them -- in a non-messy way nonetheless! If you're going to break your morning fast with coffee, do it with MCTs. And if you're going to do it with MCTs, do it with ones that taste good: Keto Coffee. KETO COFFEE CREAMER: THE NEW WAY TO ENJOY COFFEE. Sparta knows that Keto is growing in popularity for numerous reasons. We want to create new ways for keto dieters to enjoy the same amenities of life that others do, even if that is as simple as enjoying a damn good cup of coffee. The ketogenic diet has gone mainstream throughout the fitness community, and most adults (regardless of their dietary preferences), love to drink coffee! Merging these trends together, we wondered why there were no truly keto-friendly solutions that weren't oily disasters and also tasted good. At some point, we stopped wondering, and we began formulating. Keto Coffee as born. But don't let the name fool you - this is a coffee creamer - you bring the coffee yourself! Our keto-specific products are intended to help people get the most from their new diet, both physically and mentally. Keto Coffee Creamer is our gift to coffee fans everywhere -- keto dieters and non-keto dieters alike! MCT OIL’S ROLE FOR KETO DIETERS. MCT stands for medium chain triglyceride. MCTs are a unique type of fat that bypass the liver and are used as a near-immediate energy source in the body. Once they are broken down by a process known as beta-oxidation, MCT oil increases ketone levels in the body, making it the perfect start to a day. These benefits all come in addition to MCT's ability to serve as a readily-usable form of energy for the body, ideal for keto and non-keto dieters alike. If this is your first time hearing about Sparta Nutrition, understand that we are a dietary supplement company with award-winning flavors despite the fact that we often use ingredients that don't taste too great. MCT oil is easy by comparison -- Sparta doesn’t offer average flavors. You spend hard earned dollars on all kinds of products, and what you buy should be as enjoyable to drink as it is beneficial to your health. No matter what your preferred flavor may be, Sparta has carefully selected the most sought-after coffee flavor additions for you to choose from. Your morning coffee has never tasted as good as it will now with Keto Coffee Creamer - and that's with no sugar added! Ketogenic dieters are "different". We say that as a good thing -- because we're only "different" in that we reject the low-fat garbage that's been pushed down our throats the past few decades. Not ironically, those decades have had nothing but skyrocketing health problems and metabolic disorders. We've lived those lies, and now we're back to a healthier, more natural way - and we're bringing our coffee back for the ride as well. But now we have a collective sweet tooth, and we have to get creative to find alternative sources of fuel and flavor replacements for those sugary and carbohydrate-laden formulas everyone's become so accustomed to. 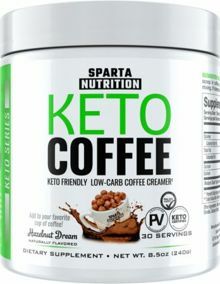 Keto Coffee is the perfect combination of a clean energy source (via MCT oil) and epic flavor that is second to none. Coffee Creamers fill row upon row in the grocery store's fridge section, yet they have all eluded keto dieters -- up until now. Healthy individuals have been in the cold for too long, and Sparta Nutrition has finally delivered a hot new product to meet your needs in terms of your keto lifestyle, energy, and first-class flavoring. CHECK OUT THE REST OF OUR KETO SUPPLEMENT SERIES. We designed these supplements to help you as a hard-training athlete, because we know how hard it is to stay ahead of the game with minimal carbohydrates until you're fully fat-adapted (which can take several months). Just like many coffee "creamers" can obliterate your state of ketosis right from the start of the day, other proteins and workout supplements can do the same thing, spiking insulin and blood sugar, outside of a normal range, in the body so high that your body is forced to ditch the ketones to deal with the glucose. So we designed a series of products to ensure you get what you need, all while supporting -- and even enhancing -- a state of ketosis. It's known as the Sparta Keto Series, and if you're interested, please also check out Keto Boost (BHB electrolyte supplement), Keto BCAA (BHB electrolytes and aminos to take during training), and Keto Pre Extreme (our ketogenic-friendly pre workout supplement). Meanwhile, just as everyone will love Keto Coffee discussed on this page, Keto MRP is another product that will benefit all keto dieters, not just the athletes. But athlete or not, we have your coffee creamer needs taken care of - but if you need help with the workout and a meal in a hurry, Sparta Nutrition is there for you too. You should never compromise on the supplements you buy, and with Sparta, you never will. Choose the best, choose Sparta Nutrition.